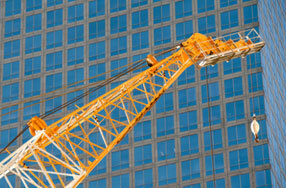 The law requires construction contractors to make safe crane operation a high priority. By law, safe crane operation must be a high priority on every work site. There are many different types of cranes, but they all share the same common function: cranes move large and heavy loads through the air from one point to another. That means that anything within reach of the moving crane that gets in the way of the crane or its payload will be crushed. Be recertified every five years. Prior to starting crane operations, the contractor or entity in control of the job site must conduct a walk through identify any potential hazards. If crane operations must take place in an area where the crane’s boom can come into contact with power lines, then the lines must be de-energized, or the lines must be covered, or a person must be designated as a “spotter” to do nothing but stand and watch to make sure that the crane boom stays away from the power lines, while maintaining direct contact with the crane operator (typically via a dedicated radio channel) at all times. If a load must be moved at a site where the crane operator does not have complete and clear line of sight view of the load and the landing area at all times, then a dedicated “signal man” must be assigned to a position from which the signal man has a clear line of sight view of the load and the landing area at all times, along with a method of signaling to the crane operator at all times. There are different and varied Washington Industrial Safety and Health Act [WISHA] regulations that apply to articulating boom cranes, derrick cranes, gantry cranes, portal cranes, side-boom cranes, and tower cranes, among others. The law requires that each type of crane have certain safety devices, that each type of crane be assembled, maintained, repaired, and regularly inspected by qualified personnel, and that all wire ropes used for rigging be of a certain strength and subject to regular inspection and replacement. Additionally, the methods by which payloads are secured, put in a lifting sling, and then attached to the crane’s lifting hook are all highly regulated. In the event of equipment failure, which typically results in a dropped load, the primary focus of any post-injury investigation should be whether any of the WISHA safety regulations for assembling, maintaining, repairing, inspecting or replacing equipment or rigging components was violated. When a load comes apart and is dropped, then the primary focus of the post-injury investigation should be whether the rigging crew had the training and experience to properly bundle and attach the load to the crane, and whether they used the appropriate rigging method for safely hoisting the load. Never lift a load over a worker. At Kraft Davies, PLLC we have successfully litigated cases involving negligent crane operation and improper rigging that resulted in severe crushing injuries, amputations, and electrocutions, on land and at sea. We are experienced personal injury attorneys and we provide aggressive representation to our clients (injury victims and family members pursuing wrongful death claims), whose lives have been turned upside down by crane accidents. Kraft Davies, PLLC is a Seattle-based law firm, but we represent injured workers from all over the state, in every county and federal court in Washington. If you hire Kraft Davies, PLLC, you will pay us no fee unless we win financial compensation for you! Don’t Wait When You Can Get Our Advice for Free – Call Now! If you have been injured or lost a loved one in a crane accident, you need to protect yourself from further injury by learning about your legal rights. To speak to an experienced lawyer and get a free, no obligation consultation, call Kraft Davies, PLLC today at 206.624.8844. Alternatively, you may email your inquiry to us by clicking here.